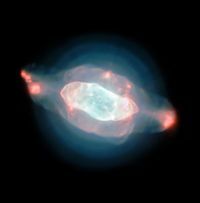 The Saturn nebula (NGC 7009) is a planetary nebula in the constellation of Aquarius. The nebula was named by Lord Rosse due to its similarities to the planet Saturn, when its rings are seen nearly edge on. Its appearance is very similar to another planetary nebula, the Cat's eye nebula. The nebula is best observed in later summer, in the months of July, August and September. The nebula was first observed by William Herschel on September 7, 1782. One of the first nebulae Herschel discovered, he was the first to refer to the Saturn nebula and others like it as planetary nebulae. However it was Lord Rosse in 1840 who first called it the Saturn nebula. The nebula's apparent size of 41x35 arc seconds corresponds to a physical radius of 0.2-0.4 light years. There is large uncertainty in the distance to the nebula, many estimates put it at 2,000-4,000 light years but the most recent suggests it is closer to 5,000 light years. The nebula is approaching us at around 45 km/s. A recent study by the MUSE (Multi Unit Spectroscopic Explorer) instrument on the Very Large Telescope has been used to observe the nebula. The highly detailed optical maps of gas and dust produce have revealed that the nebula has a complex structure, consisting of various jets of gas, several shells, knots, filaments, ansae and a halo surrounding the nebula. The ansae are the two large handles of low density gas that project out from the disk and are notably impressive in this nebula. These have been observed in other nebulae such as the Cat's eye nebula and the Ghost of Jupiter. Like most planetary nebulae, there is a star at the centre of the nebula. The star, a white dwarf, has a temperature of 55,000 K and a magnitude of +11.5. Its great distance for Earth means this corresponds to an absolute magnitude of +1.5, meaning it is about 20 brighter than the Sun. This page was last modified on 23 June 2018, at 09:23.